The last couple decades of American history have proven that well paying jobs are not always easy to come by. As the cost to live becomes more expensive and salaries largely stay put, cannabis lovers in recreationally legal states around the country are looking to find six figure marijuana jobs in the still budding industry. While it has taken a long time to get the kind of traction the cannabusiness is finally experiencing, the industry is one of the few actively creating appealing jobs and even jobs that pay employees salaries of $100,000 or more. We’ll take a look at some of the most sought after six figure marijuana jobs inspiring unsatisfied employees and professional stoners from all walks of life to pursue a bright new career path. Cannabis consulting jobs are in high demand as more states pass cannabis laws and award licenses to future business owners. Since the process of opening dispensaries, commercial edibles kitchens or grow operations is a convoluted and even frustrating process, cannabis consultants are employed to help navigate through the confusion. Consultants fulfill a variety of roles and often times, niche cannabis consulting firms will offer a diverse array of services and personnel to assist new business owners with every aspect of their burgeoning company’s success. Some cannabis consultants are industry businesspeople, while others are lawyers or accountants. Most any cannabusiness can benefit from lawyers fluent in cannabis industry law. The threat of having your business closed down for not complying to state regulations is a pervasive reality that owners do their best to avoid. Since cannabis is still criminalized on a federal level, very few businesses are able to open bank accounts given the fears banks have toward being penalized themselves. Because of this, the legal industry is still predominantly a cash-only business. In order to comply with daily bookkeeping and yearly tax filing, business owners will contract cannabis consultants who are accountants. Though accounting services aren’t cheap, they give businesses peace of mind that they won’t receive audits. 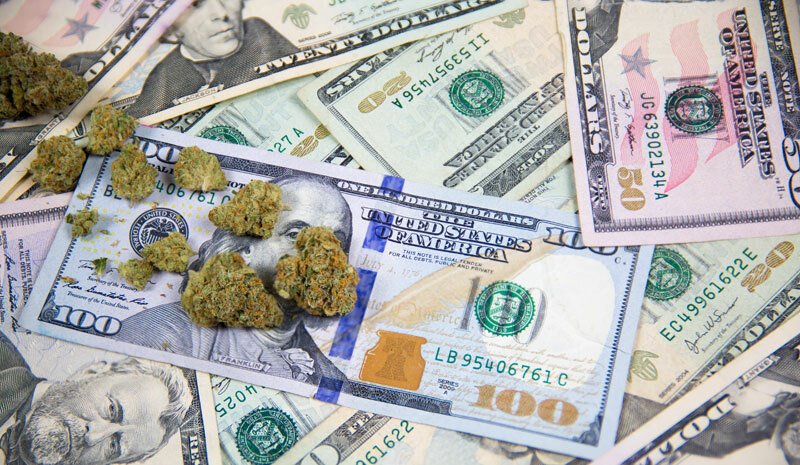 All said and done, cannabis consulting is one of the most lucrative six figure marijuana jobs, with salaries beginning around $100,000 and above. Another sector of the legal industry experiencing higher than usual demand are concentrate creators. Concentrates are made by taking cannabis flower and trim, then introducing solvents, heat and pressure to extract the necessary compounds and leave the plant matter behind. This process creates a highly potent substance that comes in a diverse array of textures. Cannabis extraction technicians jobs are responsible for facilitating the process of turning plant matter into concentrates, without compromising the cannabinoids, terpenoids and other substances. Cannabis extraction technicians are classified as jobs for stoners with college degrees, since the job carries the potential of fire and calls for extremely detail oriented technicians with prior experience with extraction. Extraction technicians are key members of the legal cannabusiness since they create substances especially useful for the medical marijuana community. The high potency allows for patients to experience longer, more intense effects in far fewer doses. Whereas cannabis flower strains seldom contain more than 30% THC, concentrates often contain 75-80% or more. In keeping with the responsibilities of this post, extraction techs are compensated respectably, with wages for entry level extraction jobs average between $20,000-40,000, while leadership positions in this field pay employees well into six figure marijuana jobs. As concentrates surge in popularity, marijuana edibles and edibles creation jobs are following suit. Dispensary customers are becoming increasingly interested in a broad spectrum of cannabis consumables and desire tasty edibles that satisfy the hunger and quench the thirst, without an overwhelming taste. In ways, marijuana edibles can be viewed as the future of medical cannabis treatment, as consumables allow patients to ingest cannabis and experience the effects of THC and CBD, without having to smoke. In keeping with the continued proliferation of more and more varieties of edible products are modern tactics for infusing food with cannabis compounds, without including any cannabis plant matter. While some edibles creators choose to use traditional methods of adding cannabutter to recipes, many facilities opt to use concentrates, since they allow for more exact measurements and can be more easily disguised into the flavor of the food. Edibles creators, like extraction technicians make different wages depending on this job description, but some edibles chefs for established companies make $90,000 or above. One of the most attractive ventures drawing hopefuls into the cannabusiness is the possibility of owning a cannabis dispensary. Cannabis dispensaries have appearing with greater frequency over the years in medically legally states and now, recreational ones as well. Cities like Denver, Colorado and Portland, Oregon are heavily saturated with legal pot shops that bring in lines of eager customers. While dispensary ownership carries the potential for being one of the viable six figure marijuana jobs out there, it is also one of the riskiest positions someone I the industry can pursue. As mentioned earlier, dispensary owners frequently employ cannabis consultants to help guide them through the thorny process of becoming established and turning a profit selling legal weed. The concept of owning a dispensary seems easy enough: if you build it, they will come—unfortunately, this is not always the case. With each passing year, the competition between dispensaries increases and the likelihood of striking it rich diminishes. Using Oregon as an example, January 1st 2017 marked the official start date for recreational marijuana sales under updated regulations. The last two years have allowed for Oregon medical dispensaries to sell to recreational customers until regulations have been finalized. Now, under the updated laws, medical dispensaries can only sell to medical customers and therefore, are at a much higher risk of losing significant revenue as their client base diminishes. With all this said, there are more than a handful of successful dispensary owners working six figure marijuana jobs. Those who were early to the game and established a strong brand and marketing presence are at a greater likelihood of rising to the top and reaping the financial rewards therein. Like dispensary owners, grow masters are some of the more recognizable members of the cannabis industry. It has been a dream of many to pay their bills by cultivating a healthy cannabis crop and admittedly, more and more home growers are turning out impressive results; grow masters, however, have years of experience and credibility that allow them to grow large scale successful crops to sell to dispensaries and processing facilities. In black market days of yore, successful grow masters whispered earnings well into six figures, into the millions. While these earnings are unlikely to be found in the legal business, cultivators can still make $100,000, plus bonuses depending on the success of their crop. Grow masters not only facilitate seed germination and other milestones like transporting and cloning—additionally, they are responsible for setting up the parameters of the operation and optimizing everything from humidity and nutrition to pest control and pruning. All things considered, being a grow master is not a hands-off, relaxing job. In many cases, grow masters don’t work designated hours, rather, they invest much of their personal and professional time ensuring crop progress and eventual success. The backgrounds of some of the industry’s top grow masters is diverse, but the legal industry is showing an interest in cultivators with degrees in horticulture and agriculture. Aside from direct cultivation responsibilities, grow masters will likely instruct a team of assistant growers who help with maintenance and any other tasks the grow master suggests. Website and app creation is a booming business across nearly every industry. Concerning consumer-driven industries like cannabis, online development has been a key factor in normalizing the industry and making it easier for cannabusinesses and customers to connect. The west coast has already asserted itself as a major hub for online startups, coincidentally in the same locations as many of the recreationally legal states for cannabis. Therefore, major developers in places like San Jose, San Francisco, Seattle and Portland have the embed experience of learning what services are in the most demand. Particularly since the legal cannabis industry is in ways still “untapped” when it comes to online apps and resources, web developers are rushing to create the next it-app to leverage such overwhelming interest in this industry. Two now-classic examples of developer success in this business are dispensary directory-drive apps Leafly and Weedmaps. Both applications offer similar and different services, but ultimately help locate dispensaries and other cannabusinesses near to the consumer. These easy-to-use attractive websites and applications allow for creators to enjoy six figure marijuana jobs relying mostly on “passive” income. As more states pass legislation legalizing cannabis, developers are able to reach a large enough demographic to make a splash in the industry. It is becoming increasingly clear as businesses are spending thousand of dollars to advertise on the aforementioned services, tat web developers hold a certain concentration of power in deciding where the cannabusiness goes. In addition to web developers, CEOs and editors for cannabis-specific publications are hitting the big time as their online presence skyrockets with an evolving interest in cannabis culture. Sites like High Times are popular hubs for accessing regularly updated cannabis news, strain and product reviews and culture editorials. Especially in the case of readers who live in states where cannabis is either still illegal or viewed with greater stigma, resources like these can be vital to informing and inspiring cannabis advocates from around the country and the world. As a greater number of online magazines crop up, it is crucial to provide something fresh and new to the conversation if you’re looking to make magazine editing a viable six figure marijuana job. Online and print magazines like Culture smartly use celebrities and other figures of cultural significance to bring a wider range of readers to this cannabis-themed publication. Depending on the circulation and readership of the magazine, editors and CEOs have the potential to bring in big paychecks through advertisements and other endorsement deals. Some publications form business partnerships with cannabis job training services or product lines to simultaneously bolster the earnings of each business. The legal industry will prove to be very interesting throughout the current political regime, but it’s likely to continue to boom in states where legal measures have already been put in place. While it’s unlikely that much federal headway will be made in this four year term, the cannabusiness simply can’t be slowed down. Six figure marijuana jobs will not only continue to exist, but will become an established facet of the legal industry. Given how new the cannabusiness is in legal terms, there is a great opportunity to not repeat the failures and mistakes of other industries. At present the industry offers a decent spectrum of moderate to well paying jobs and this must continue if industry leaders remember how important the role of the consumer and employee are in this business.